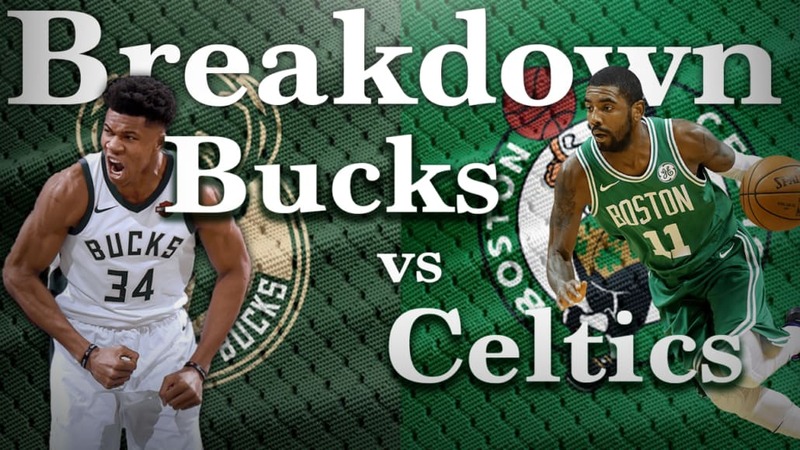 The Bucks and Celtics faced off after the All Star break, and the game was a great example of how defense can remain even though both teams were pretty rusty. I really likes what the Bucks tried to do against Kyrie and Horford, but the Celtics defense vs Giannis really stood out to me. In this breakdown we will look at the last 3 minutes, thoughts on both teams execution as well as playcalls, sets and skills from this game. The Milwaukee Bucks run a 5-Out offense with Giannis attacking at the center of it. One of the biggest keys that allowed them to win this game was their defense fueling their offense and allowing Giannis to get out in transition. The Celtics tried to defend the 3 point line, but the Bucks spacing allowed for them to counter with multiple drives to score layups. One of the most interesting things I took away from this game was the Bucks Drop coverage in the pick and roll and dribble hand offs. When the Celtics go to any ballscreen the bigs of the Bucks will drop into the lane and only allow mid range jumpers – at the same time the guards defending the ballscreen will trail and force the ball into that mid range area. The Celtics hurt them by popping Horford, Morris and allowing them to either shoot open jump shots or attack off the dribble. Going forward it will interesting to see if they do the same thing if the time comes into the playoffs. 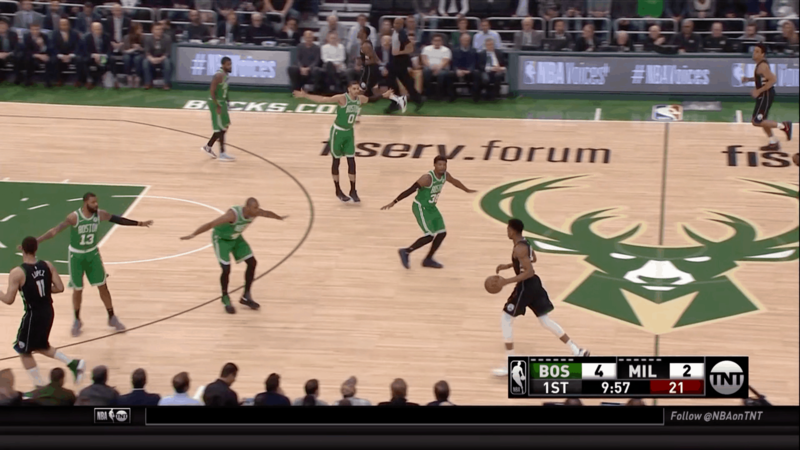 When playing the Bucks the number one objective should be to slow down Giannis in transition, and I LOVED how the Celtics really loaded to the ball and shrunk the floor by showing their hands and making the floor seem smaller. Horford and Smart are the two key players in the Celtics defense, and they really make it work because of their effort and intelligence. I love Marcus Smart and how he give 100% effort every play and the ability to know when to attack and when not to, and Horford really unlocks their ability to switch and be able to prevent some of the 3’s the Bucks normally get. The Celtics offense looked much better in terms of movement, sharing the ball, and the ability to get others involved. Attacking the Bucks drop coverage with Horford pick and pops was key, but also Kyrie really struggled to make them pay for it when they allowed him to take a mid range jumper. Although Kyrie struggled he really came up down the stretch run with big, timely shots. I expect Boston to rattle off a couple of big games with the way their offense flowed and was able to look really good at times. Below are some of my favorite sets from the game, as well as playcalls and skills I took away when watching this game. Hope you guys enjoyed this breakdown, I look forward to doing more.